First time author (well, this is his first book printed) Deepak Kripal is a doctor by profession and writer by passion. 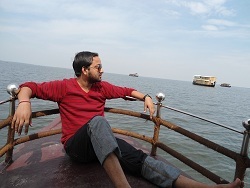 He is a known figure in online blogging community of India (literary niche of course, mainly poems and poetry). Here are our personal views about his first book The Devil’s Gate : An Impossible Journey : 1. The book takes you to a very different panorama which most of the books from modern Indian writers keep away themselves from. Various dialogs and descriptions in the book clearly shows the author’s affection towards the nature in a whole. It includes his love for environment and animals too. The author seems to have studied some of the basic Indian ancient literature as well. It would not be wrong to say that you will find the traces of some works by J. R. R. Tolkien, C. S. Lewis, J. k. Rowling, Dan Brown and others, in a different manner. Of course a writer is having his own favorites, but it doesn’t make him a copy cat of the other. We must say the influences may be there (and it is always, in all the creations), but writer came up with his original writing style. In the beginning of the book, you find some very lengthy sentences. Sometimes the entire paragraph is written in one sentence. And too much use of Comma (,) there. It also takes a little while to set up the story. But once it is setup, it is almost a flawless journey till the middle of the book. The first segment of the second half is a little less fluent, but last few pages of the climax sets the tempo again. The book is definitely a good thriller. When I started reading the book, I was wondering why a cat and a dog is chosen as the protagonists. But the questions are also answered in the second half of the book. Author went for easy to remember names for most of the characters (a couple of exceptions there). Katy – the cat, Dug – the dog, Billy – the bird, Cheeku – the child demon, Shardul – the lion; to name a few. The book, indirectly explores the problems the nature faces, due to some of the human behavior. It includes, cutting of jungles, in order to acquire land to build and develop cities. The book at various places talk about some side (and some main) effects of power hungry people and the results of their unwise decisions over the nature. The author’s vision seems to be crystal clear about the story in his mind. In fact – The Devil’s Gate – is first mentioned after around half of the book is complete. There are places where long descriptions make the things a little boring (especially in the second half); but overall it all relies on tight writing. Mostly when we talk about human heroes we talk about some larger than the life figures. Same way when we talk about animals, we mention lion, tiger and other not-so-ordinary animals in a way that they can do some heroic work. In that terms, the book explores some ordinary animals’ heroic works. It is certainly after a long time we are having ordinary animals and their tale. The book is not anti-human though. Animals seems hate some stuff about the mankind. But they are fond of, and takes note of, some genius abilities of mankind as well. It is story of ordinary animals who are assigned a mission to find out the invisible island! It is known as the island of ‘five hundred graves’ and is visible for a while in the full-moon night. There they need to meet the master of the same and negotiate with them the possibility to let the animal setup their living there. They need to take the step because most of their villages and jungles are destroyed by mankind in order to setup and develop cities there. The island is full of demons who are in hunger and thirst for flesh of the bodies! Can a deal with them possible to make out? The adventures journey is the rest of the story. The book trailer is not that appealing, if it is made like Harry Potter movie trailer, with a high budget – it would definitely attract more readers. The confidence of the writer is also must to mention. The book name itself suggests that the author is not only confident about the commercial success of the book, but he also had a well thought long story and this book is a part of chronicles he is intended to explore via his pen. The last two pages confirms that the story doesn’t end here. Seems the solved one is just a part of the problem, the main problem stills hangs on the head. Yes, we are talking about the next part or sequel of the book for sure. Overall, a nice and gripping thriller. The book is appealing for the children as well. It would be interesting to see its response by children. May be the book requires better marketing and awareness about it. It may be an Indian answer to popular kids literature (like Chronicles of Narnia; The Hobbit; Harry Potter series,…). We have had a conversation with Deepak Kripal and it was an interesting session. You can read the full interview here.